For more details, including two videos and links to download the free app, see the developer’s website. Yet it’s difficult to escape some of the harsh realities of treatment, especially as my office is next to the MRI scanner in the radiology department. The scanner is a noisy, claustrophobic tunnel that pins you down for up to an hour. You could liken it to a torture device, something you might see in a James Bond film. I’ve seen adults collapse in tears at the thought of going in, so for children it can be particularly traumatic. Often the only option is to put the child to sleep, a procedure that is costly, adds risk and is also quite scary. I always have a set of ear defenders at hand to drown out the noise of the latest child the radiographers are desperately trying to coax into the room. Those who take the scans are amazingly good at their job – I’ve seen them turn a blubbering child into one who is excited about crawling around inside the tunnel. More often, however, if the child is scared beforehand, then by the time they get to the scanner it’s too late to prepare them for the ordeal and make them feel comfortable. I decided to try to make the experience better for the children coming in for a scan. In 2015 I read about a new way to make virtual reality more accessible – and I also learned how to capture a full panorama of the world around us using 360-degree cameras. The combination of both gave me the tools to create a virtual world. At around the same time, a play specialist visited our radiology department asking for images of the scanner. She told me stories of how some children would refuse to leave home when they knew they were coming in for their MRI. She explained the downward spiral that fear of medical procedures could cause – and how it was her job to unpick the damage that had been done. I had the idea of filming in the scanner to create a virtual MRI experience in an app and told the play specialist, who thought it was fantastic. Altogether it took more than a year and a half to create the app and after enlisting the help of a developer and some colleagues in Belfast, we had a finished product. 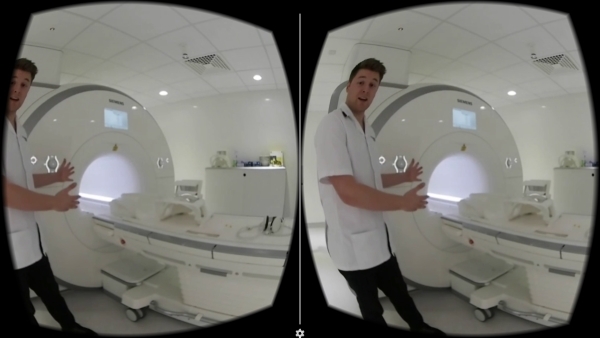 The app utilises 360-degree videos from within an MRI scanner. It’s free and allows children to experience their upcoming scan in virtual reality, helping them to understand and prepare for what is often a difficult and scary experience. We trialled it on a handful of young patients and the response was unanimous: children seemed to love it. We even had fights breaking out among siblings in the waiting areas as they all wanted a go. Some children exclaimed they were even excited to come in for their scan. An unexpected result was the impact it had on parents. It’s often the parents who are more anxious about their child’s upcoming MRI and this anxiety naturally rubs off on to the child. The play specialist had explained that if you can win over the parents, that’s half the battle. The app is in use at King’s College hospital in London, the Royal Belfast hospital and Raigmore hospital in Inverness, and it’s being developed at Guy’s and St Thomas’s hospital and Southampton hospital. More are interested and I’m looking at developing a version for adults nervous about having an MRI too. It has been a particular success with children with epilepsy. Although it’s a relatively common childhood disease, epilepsy can be extremely debilitating: one child likened their life with epilepsy to “having a monster in their head”. Doctors often don’t know the cause of the epilepsy and high resolution MRI images are a great way of seeing the subtle changes in the brain’s structure. Any movement during the scan, however, will make the images blurry – but the app prepares children so that they are better able to stay still during the procedure. We’ve managed to get these images from children as young as four without giving them a general anaesthetic – a real triumph in the eyes of the radiographers. Now I have a young daughter of my own – and I can hardly imagine how scared she would be to have an MRI. It makes me reflect back to the start of the journey of creating the app and relate afresh to the scared parents who were about to send their child to face the ordeal of the scanner. Children embrace VR technology much like my generation embraced the original computer – and like the computer, I think it’s only a matter of time before VR becomes part of our everyday lives.